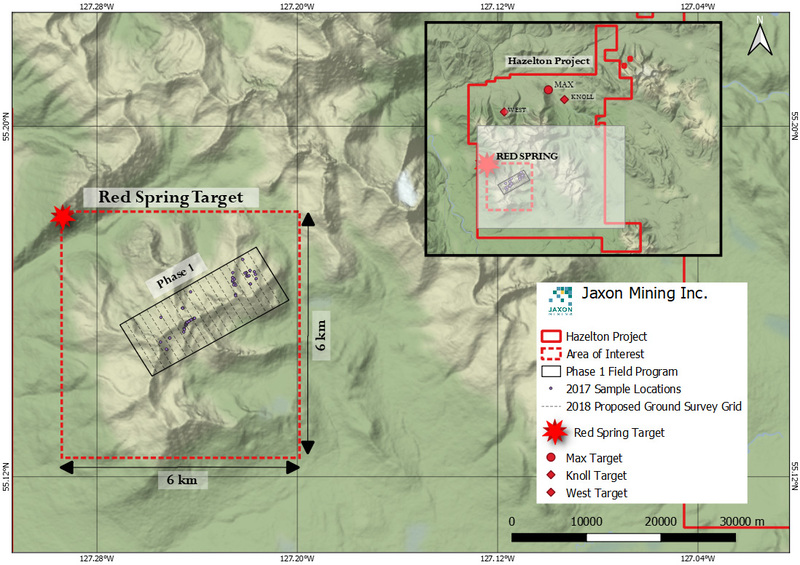 Jaxon to Start Phase 1 at Red Springs Target, Hazelton | Jaxon Mining Inc.
Jaxon Mining Inc. (TSXV: JAX, FSE: OU31, OTC: JXMNF) is pleased to announce that its first phase exploration program of the 2018 field season will commence in the beginning of June. 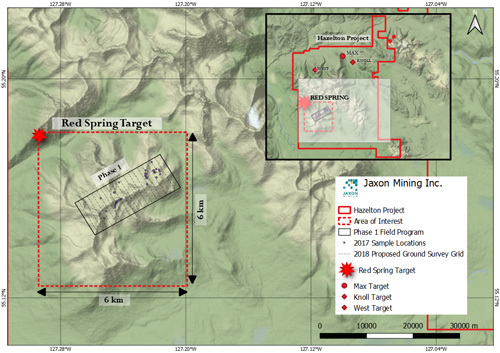 While detailed re-interpretation and analysis of geophysics data from last year’s Fall program continues at the Max project, Jaxon will initially focus on the newly discovered Red Springs target within the same Hazelton project area, 50 kilometres north of Smithers in the Skeena Arch of British Columbia. To define the genetic and spatial relationships between the large porphyry alteration zone and the mineralized breccias. Prospecting at the end of the 2017 field season identified a suite of high-grade gold bearing breccias spatially associated with argillic and sericitic alteration (see February 20, 2018 news release). Although snow cover limited the opportunity to do extensive fieldwork, a total of 49 surface samples were collected from tourmaline breccia exposures on the western side of the Red Springs alteration zone, 26 of which were gold-bearing and 8 of which contained gold ranging from 10 g/t Au - 33 g/t Au. Notably, the 33 g/t sample was a composite, comprising 12 grab (in-situ) samples over an 8 square-metre area. The identified area of breccia occurrences and alteration is approximately 36 square kilometres and Jaxon is pursuing an exploration methodology that the high-grade gold tourmaline breccias are a manifestation of a significant porphyry system at depth. Two alpine-experienced geological teams will be dispatched in the first week of June to sample and map the geology and alteration over the 36 square-kilometre area of interest. This first pass reconnaissance effort will lead to detailed channel sampling. Simcoe GeoScience has been retained to use their experience in the Golden Triangle to complete a detailed ground magnetometer survey and Time Domain IP/Resistivity survey. This will total 16 line-kilometres to depths of at least 400 metres, covering the gridded high priority 6.4 square-kilometre target area. This program is designed to evaluate the depth of tourmaline breccia bodies and outline their associated intrusive centres with developed porphyry systems. This method has been successfully used to explore gold-copper bearing tourmaline-rich mineralized systems in Peru and Mongolia. Jaxon will utilize the expertise and interpretation products of Simcoe GeoScience in preparation for a Fall drilling campaign. Technical information in this news release has been reviewed and approved by Carl Swensson, F. AusIMM., a qualified person as defined in National Instrument 43 -101. For further information regarding Jaxon Mining Inc., please contact Mark Carruthers at 604-608-0400 Toll free: 1-877-608-0007.